Bighorn sheep (Ovis canadensis) are one of the most sought after game animals across the western United States and management of this species receives considerable attention from both state and federal agencies. Populations of bighorn sheep occupy a large portion of mountain ranges across Nevada and recent trends suggest that some of their populations are in decline. Due to their economic and aesthetic values, bighorn sheep are a high priority for game managers across the state, and the Nevada Department of Wildlife (NDOW) has invested substantial financial resources in managing these species. Over the past decade NDOW has been translocating and managing all three species of bighorn sheep in Nevada (Desert, Rocky Mountain, & Nevada). NDOW has also fitted a large number of sheep with GPS and VHF collars to gain valuable information about resource selection, home ranges, demographics, and movement. This research will increase NDOW’s ability to effectively manage vital recruitment and seasonal habitat for bighorn populations across the state. This project will also increase the understanding of male movements and how they affect disease transmission to surrounding ranges. 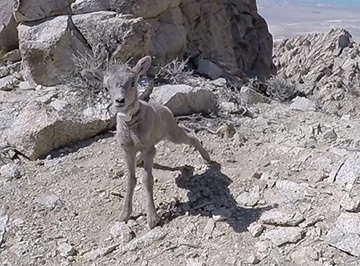 Overall, this research will largely contribute to bighorn sheep management across the state and may improve NDOW’s ability to increase recruitment rates within specific ranges as well as to identify high-quality lambing habitats to enhance population growth. Conduct a population demographics analysis to determine population productivity: adult survival, lamb survival and recruitment into the breeding population. Evaluate survival and recruitment of lambs into the breeding population. Evaluate movement patterns and pathways of adult males, especially with respect to long distance movements and those corresponding effects on population productivity.